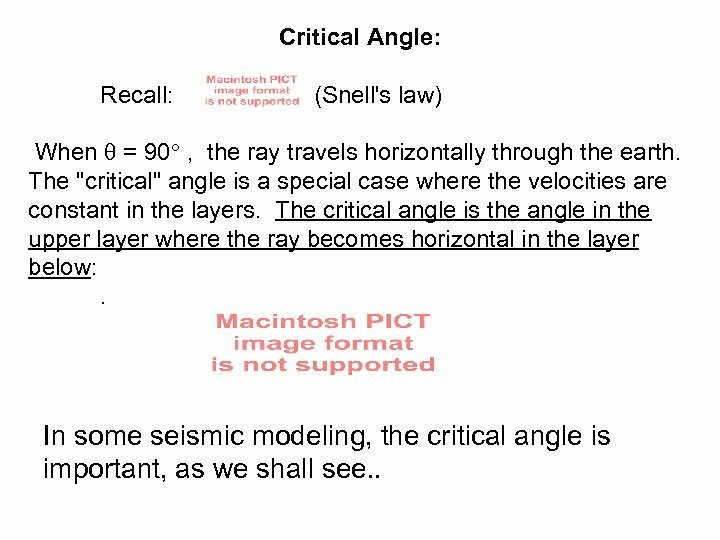 Critical Angle: Recall: (Snell's law) When = 90° , the ray travels horizontally through the earth. The "critical" angle is a special case where the velocities are constant in the layers. The critical angle is the angle in the upper layer where the ray becomes horizontal in the layer below: . 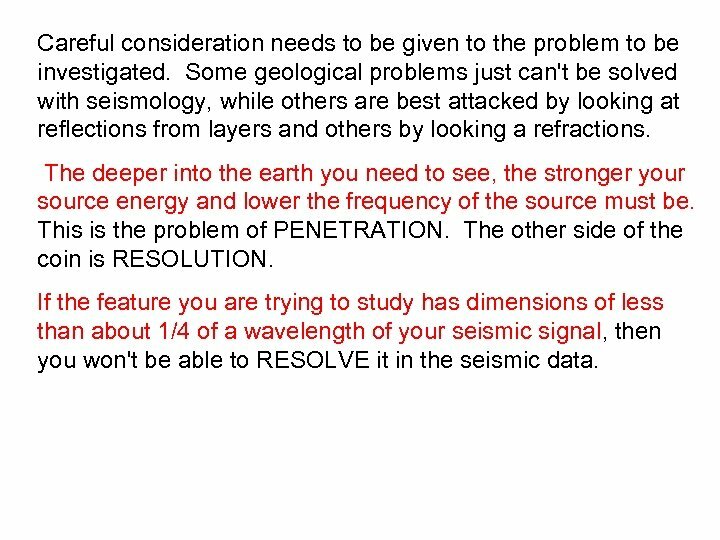 In some seismic modeling, the critical angle is important, as we shall see. .
Don't confuse the refraction method with the reflection method: REFLECTION Method: Geometry: A common seismic method involves the source - usually explosive, being moved along the surface of the earth at the same speed as the receivers, so that the distance between the source and receiver remains constant. This method is termed "profiling" and the resulting records are called profiles, often plotted as distance along the profile vs. time after the "bang". Profiles often show a close resemblance to geological profiles. A marine profile is shown as an example. REFRACTION METHOD: A second type of geometry has the source remaining at one spot and the receivers spaced at increasing distances from the source. 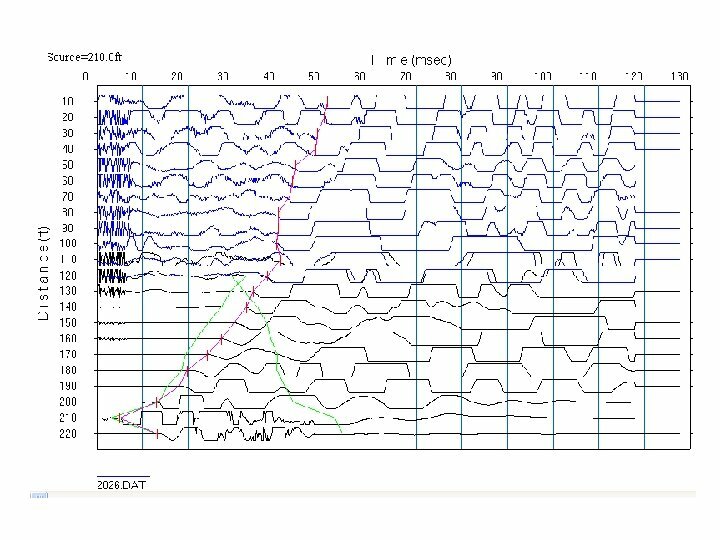 In this case, seismic arrivals as they change with distance are plotted. The resulting plot is an x-t plot, travel time plot, or "record section". The source MOVES WITH the receiver in a PROFILE. The source stays fixed (usually at x=0) in an x-t plot (record section). 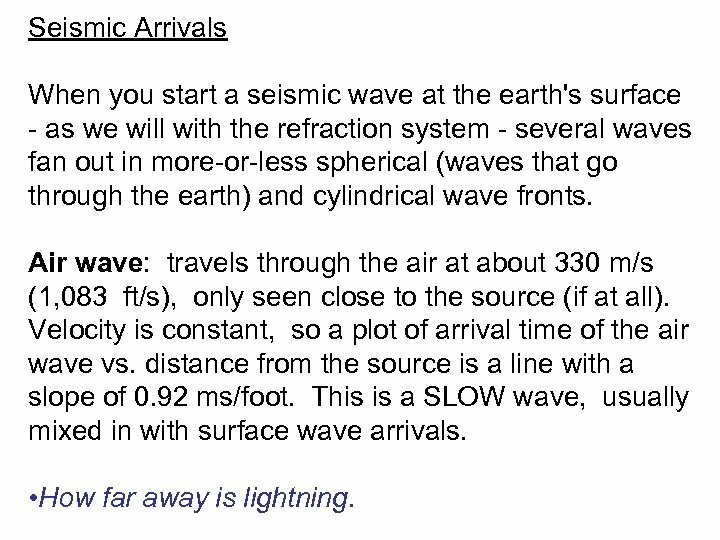 Seismic Arrivals When you start a seismic wave at the earth's surface - as we will with the refraction system - several waves fan out in more-or-less spherical (waves that go through the earth) and cylindrical wave fronts. Air wave: travels through the air at about 330 m/s (1, 083 ft/s), only seen close to the source (if at all). Velocity is constant, so a plot of arrival time of the air wave vs. distance from the source is a line with a slope of 0. 92 ms/foot. This is a SLOW wave, usually mixed in with surface wave arrivals. • How far away is lightning. Direct Wave: Travels at the p-wave velocity of the uppermost layer of the ground, directly to the receiver. Direct waves come in first close to the source, but often disappear at larger distances or are lost in earlier, faster arrivals. The direct wave arrival time is usually a straight line or curved slightly downward. Reflections: Reflections arrive from sharp changes in velocity (actually impedance, v) below. When plotted on a x-t plot, the first reflection arrival time is asymptotic to the direct arrival. Reflections bend upwards on x-t plots. 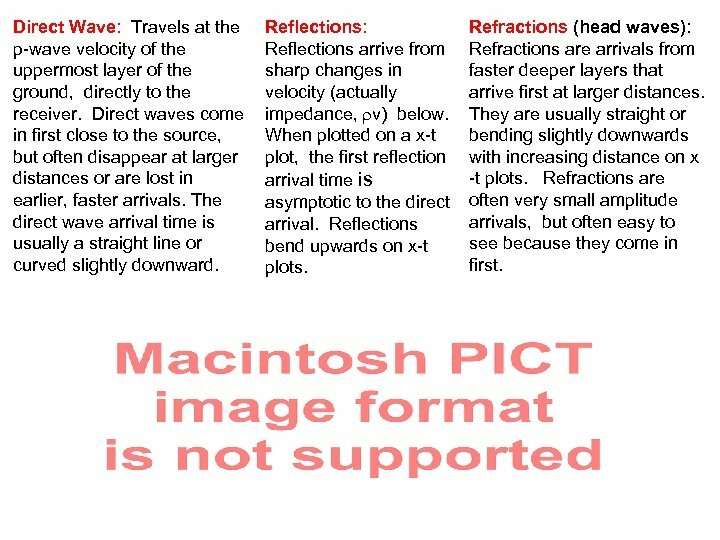 Refractions (head waves): Refractions are arrivals from faster deeper layers that arrive first at larger distances. 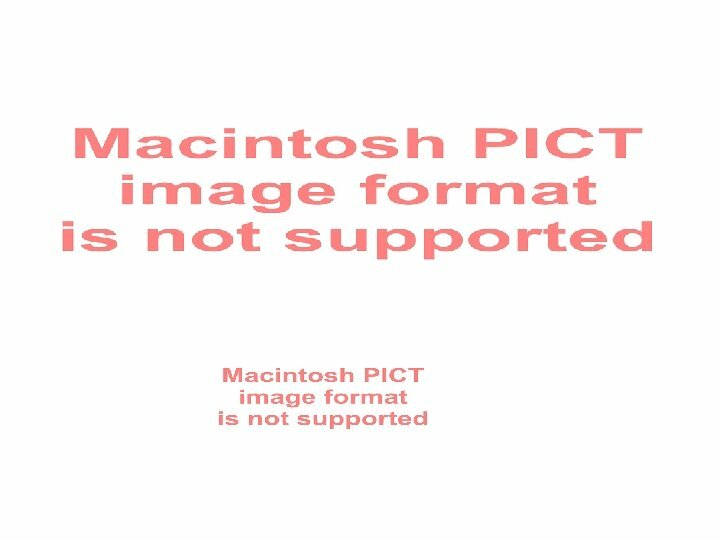 They are usually straight or bending slightly downwards with increasing distance on x -t plots. Refractions are often very small amplitude arrivals, but often easy to see because they come in first. 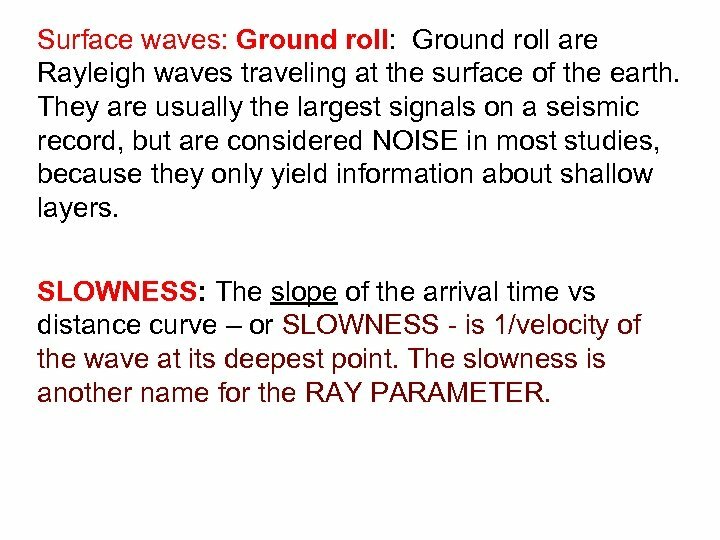 Surface waves: Ground roll: Ground roll are Rayleigh waves traveling at the surface of the earth. They are usually the largest signals on a seismic record, but are considered NOISE in most studies, because they only yield information about shallow layers. SLOWNESS: The slope of the arrival time vs distance curve – or SLOWNESS - is 1/velocity of the wave at its deepest point. 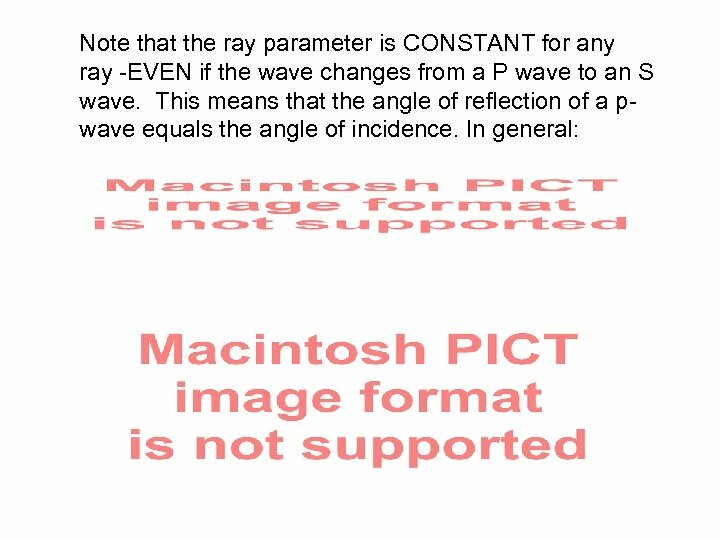 The slowness is another name for the RAY PARAMETER. diffractions: when a wave hits a sharp boundary along a profile, that boundary acts as a wave radiator, and a diffracted arrival is generated. When diffracted seismic arrivals are plotted as arrival time vs distance from the diffracting boundary, the arrivals are hyperbolic in shape. Diffracted arrivals come from boundaries that are NOT directly below the source and receiver. This plot shows a PROFILE of the arrival time of a diffracted arrival from point diffractors at depths of 1. 5 and 4. 5 km below the surface for a velocity of 1. 5 km/s. Attenuation and amplitude changes with distance. Spreading: as waves radiate away from the source, the energy spreads out. The energy of a wave is proportional to the square of the amplitude, so as the energy spreads out, the amplitude decreases, although the total energy remains constant. 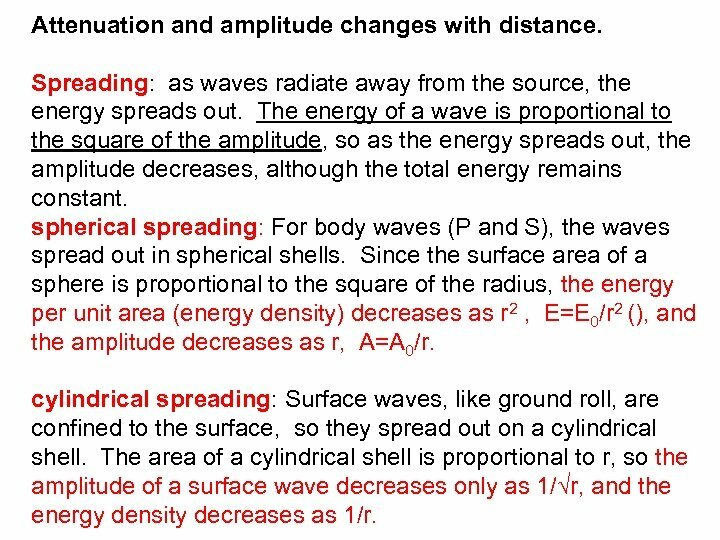 spherical spreading: For body waves (P and S), the waves spread out in spherical shells. Since the surface area of a sphere is proportional to the square of the radius, the energy per unit area (energy density) decreases as r 2 , E=E 0/r 2 (), and the amplitude decreases as r, A=A 0/r. cylindrical spreading: Surface waves, like ground roll, are confined to the surface, so they spread out on a cylindrical shell. The area of a cylindrical shell is proportional to r, so the amplitude of a surface wave decreases only as 1/√r, and the energy density decreases as 1/r. 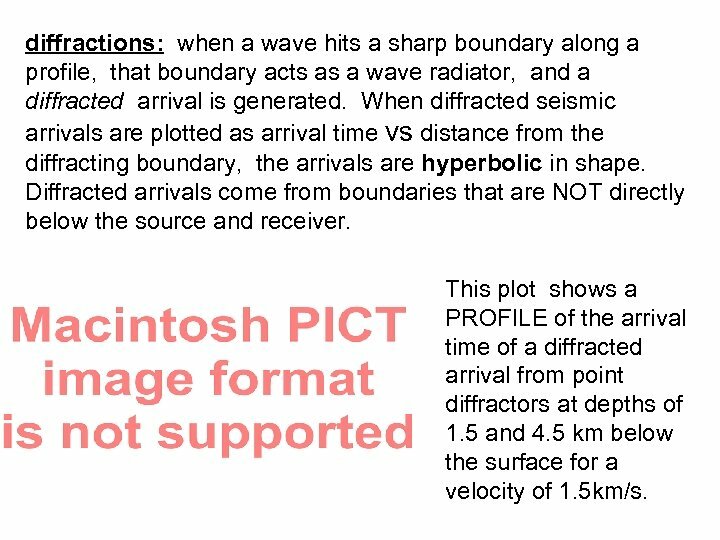 On a sphere, you might expect a surface wave to be just as large at the antipode (the point directly opposite the source) as it was at the source. This doesn't happen (although there are signs of large amplitudes on Mars opposite large impact craters) because of ATTENUATION and SCATTERING. 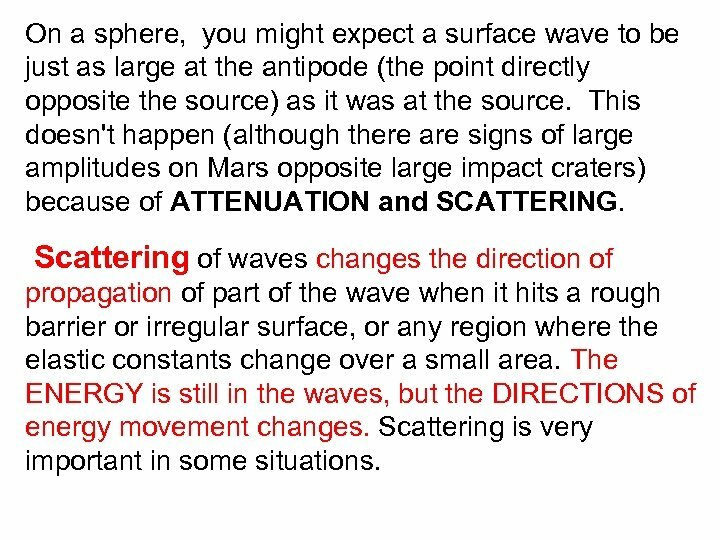 Scattering of waves changes the direction of propagation of part of the wave when it hits a rough barrier or irregular surface, or any region where the elastic constants change over a small area. The ENERGY is still in the waves, but the DIRECTIONS of energy movement changes. Scattering is very important in some situations. 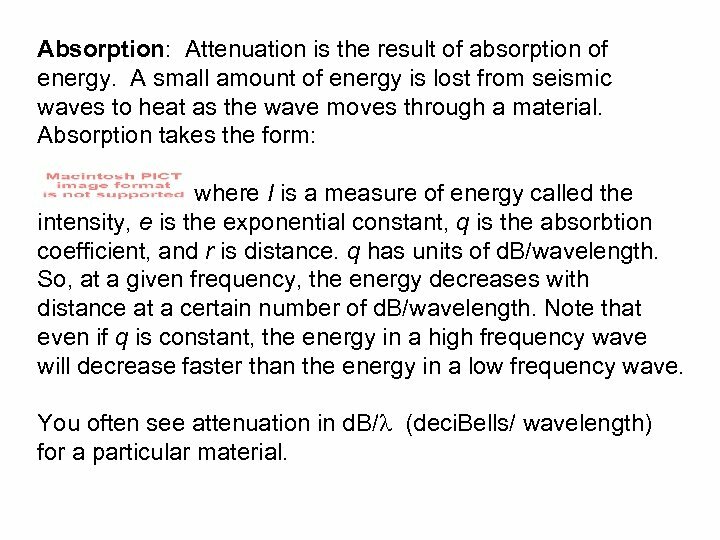 Absorption: Attenuation is the result of absorption of energy. A small amount of energy is lost from seismic waves to heat as the wave moves through a material. Absorption takes the form: where I is a measure of energy called the intensity, e is the exponential constant, q is the absorbtion coefficient, and r is distance. q has units of d. B/wavelength. So, at a given frequency, the energy decreases with distance at a certain number of d. B/wavelength. Note that even if q is constant, the energy in a high frequency wave will decrease faster than the energy in a low frequency wave. You often see attenuation in d. B/ (deci. Bells/ wavelength) for a particular material. An attenuation of 0. 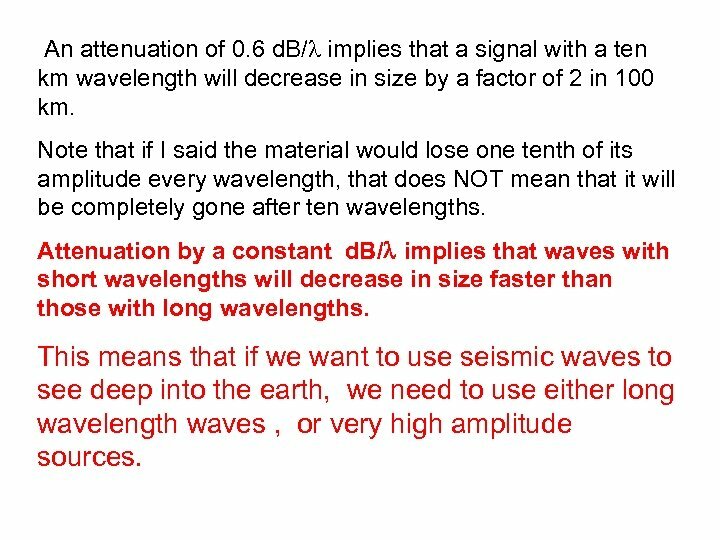 6 d. B/ implies that a signal with a ten km wavelength will decrease in size by a factor of 2 in 100 km. Note that if I said the material would lose one tenth of its amplitude every wavelength, that does NOT mean that it will be completely gone after ten wavelengths. Attenuation by a constant d. B/ implies that waves with short wavelengths will decrease in size faster than those with long wavelengths. This means that if we want to use seismic waves to see deep into the earth, we need to use either long wavelength waves , or very high amplitude sources. Energy Partitioning When a seismic wave hits an interface, it splits into different waves, both reflected and refracted. 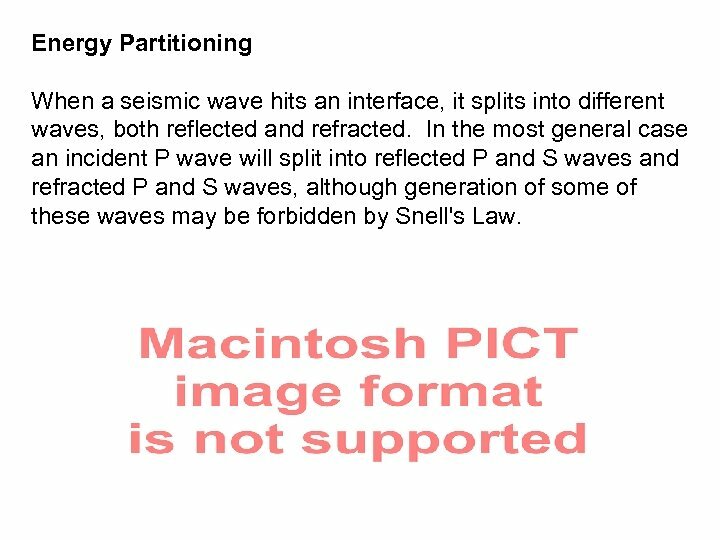 In the most general case an incident P wave will split into reflected P and S waves and refracted P and S waves, although generation of some of these waves may be forbidden by Snell's Law. 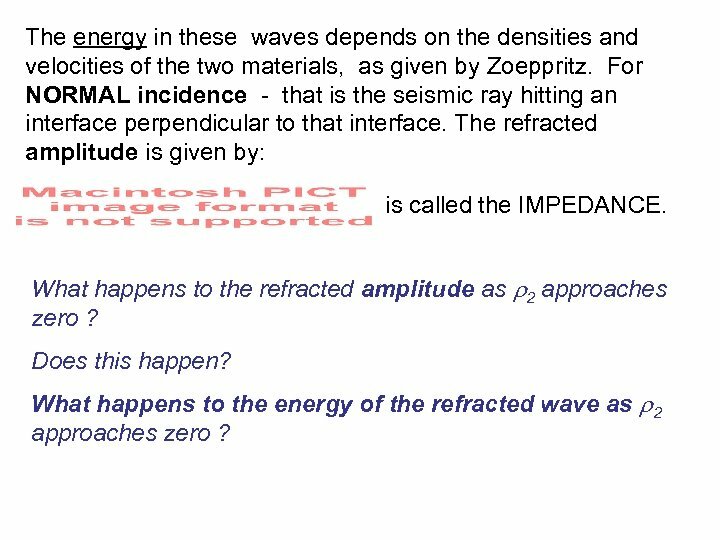 The energy in these waves depends on the densities and velocities of the two materials, as given by Zoeppritz. For NORMAL incidence - that is the seismic ray hitting an interface perpendicular to that interface. The refracted amplitude is given by: is called the IMPEDANCE. What happens to the refracted amplitude as 2 approaches zero ? Does this happen? What happens to the energy of the refracted wave as 2 approaches zero ? Remember – ENERGY is conserved – not amplitude - and energy changes as the SQUARE of the amplitude. The formula for energy (or INTENSITY) of refracted arrivals is: Notice how the intensity of the refracted wave changes as 2 approaches zero. 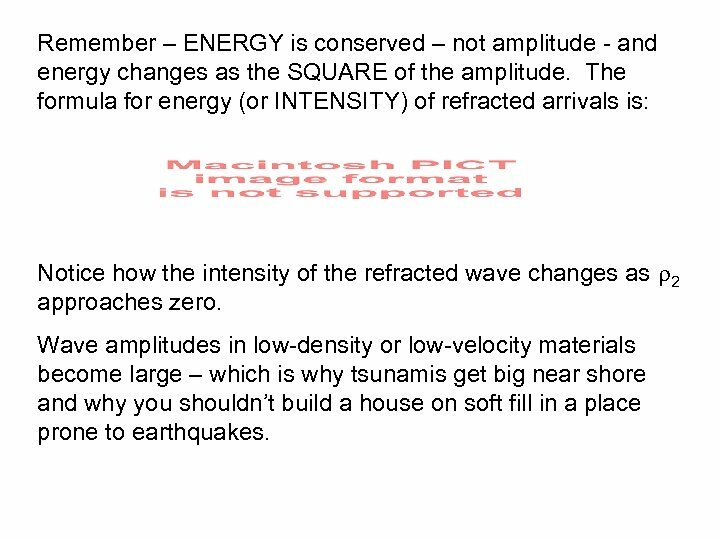 Wave amplitudes in low-density or low-velocity materials become large – which is why tsunamis get big near shore and why you shouldn’t build a house on soft fill in a place prone to earthquakes. Careful consideration needs to be given to the problem to be investigated. 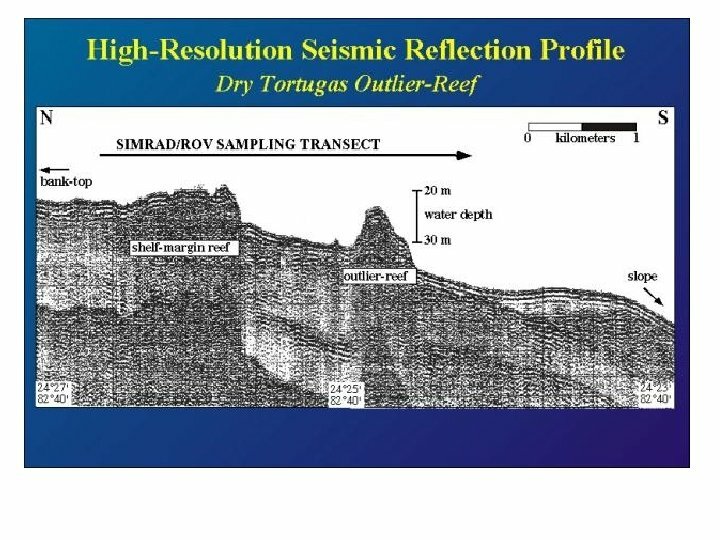 Some geological problems just can't be solved with seismology, while others are best attacked by looking at reflections from layers and others by looking a refractions. The deeper into the earth you need to see, the stronger your source energy and lower the frequency of the source must be. This is the problem of PENETRATION. The other side of the coin is RESOLUTION. 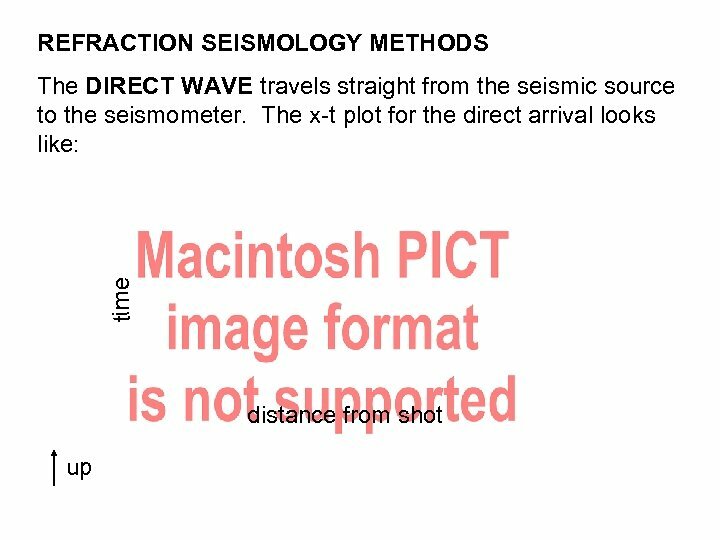 If the feature you are trying to study has dimensions of less than about 1/4 of a wavelength of your seismic signal, then you won't be able to RESOLVE it in the seismic data. SEISMIC SOURCES We need to put enough energy into the seismic waves to be sure we can see the necessary signals at our receivers. 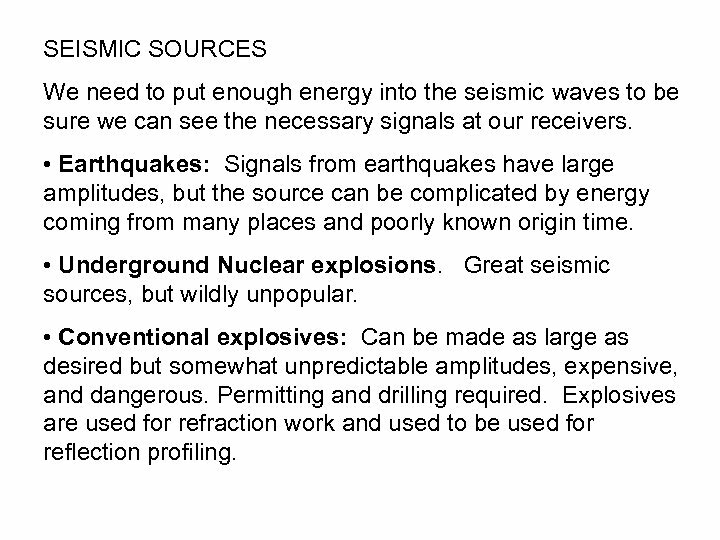 • Earthquakes: Signals from earthquakes have large amplitudes, but the source can be complicated by energy coming from many places and poorly known origin time. • Underground Nuclear explosions. Great seismic sources, but wildly unpopular. • Conventional explosives: Can be made as large as desired but somewhat unpredictable amplitudes, expensive, and dangerous. Permitting and drilling required. 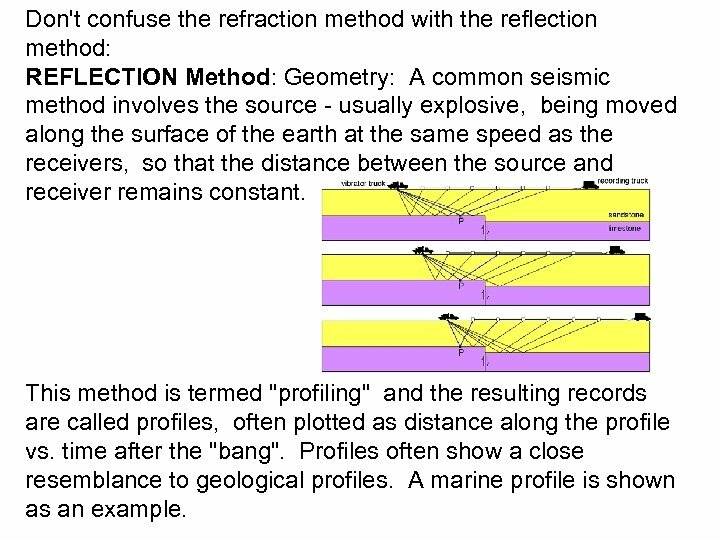 Explosives are used for refraction work and used to be used for reflection profiling. • Conventional explosives: Can be made as large as desired but have somewhat unpredictable amplitudes, expensive, and dangerous. Permitting and drilling required. 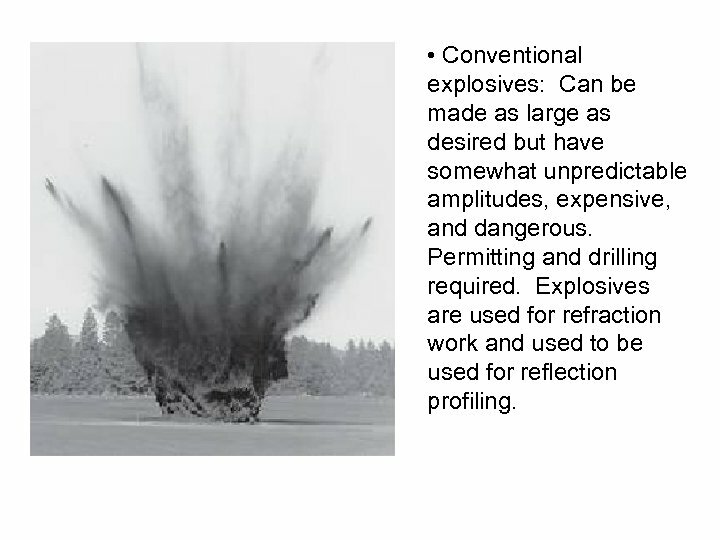 Explosives are used for refraction work and used to be used for reflection profiling. 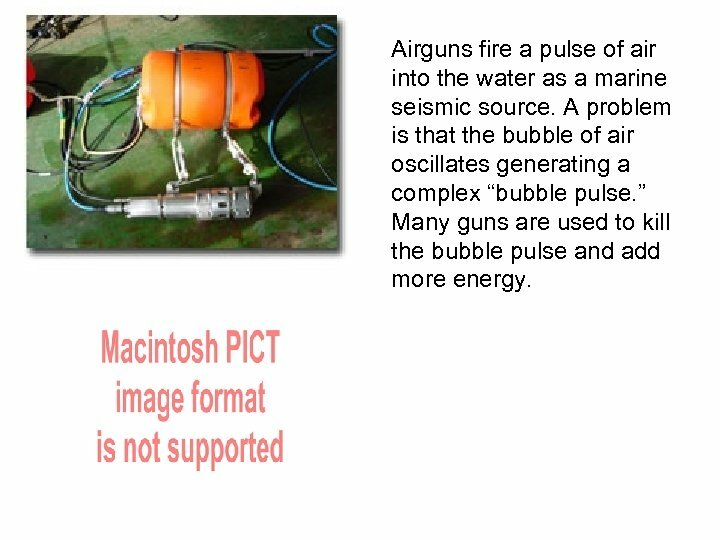 Airguns fire a pulse of air into the water as a marine seismic source. A problem is that the bubble of air oscillates generating a complex “bubble pulse. ” Many guns are used to kill the bubble pulse and add more energy. • Shotgun source. 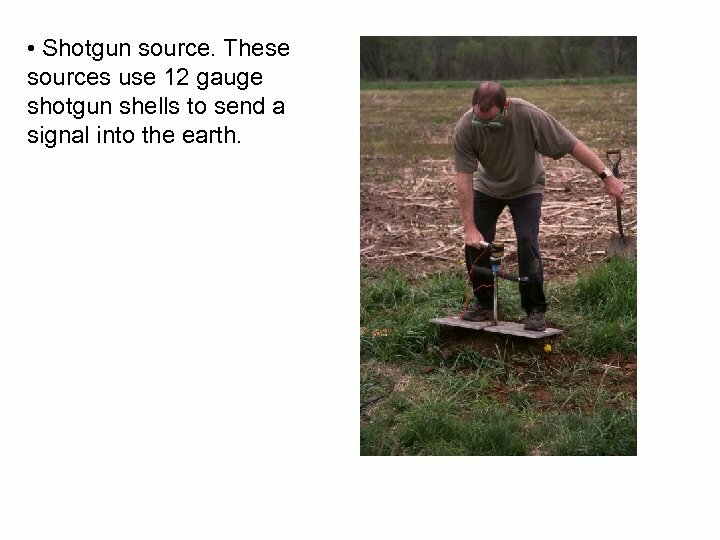 These sources use 12 gauge shotgun shells to send a signal into the earth. 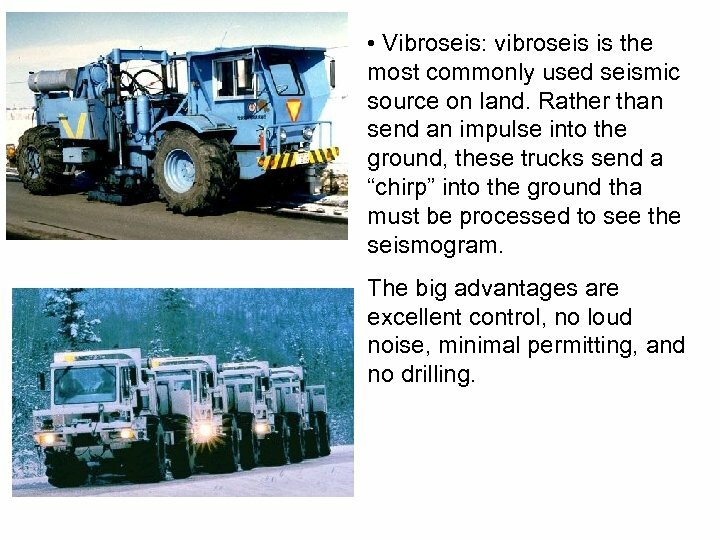 • Vibroseis: vibroseis is the most commonly used seismic source on land. Rather than send an impulse into the ground, these trucks send a “chirp” into the ground tha must be processed to see the seismogram. The big advantages are excellent control, no loud noise, minimal permitting, and no drilling. 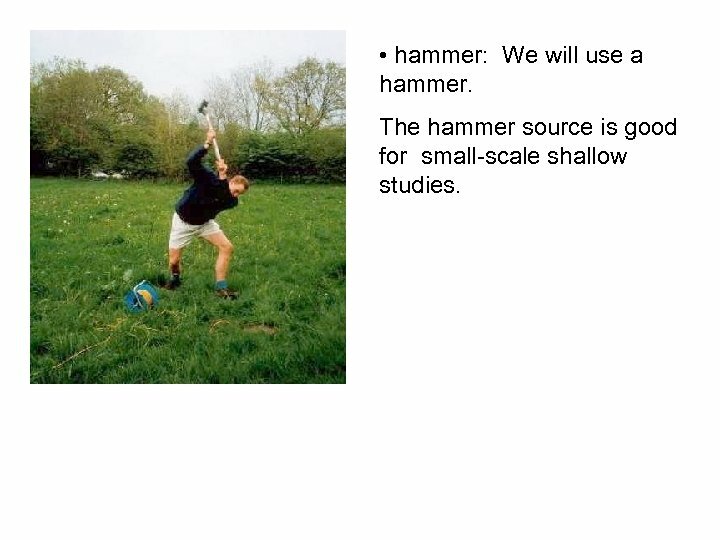 • hammer: We will use a hammer. The hammer source is good for small-scale shallow studies. 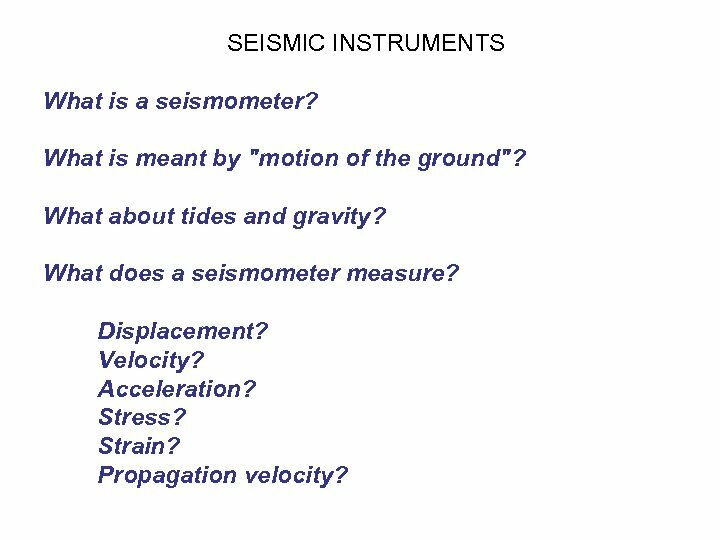 SEISMIC INSTRUMENTS What is a seismometer? What is meant by "motion of the ground"? What about tides and gravity? What does a seismometer measure? Displacement? Velocity? Acceleration? Stress? Strain? Propagation velocity? 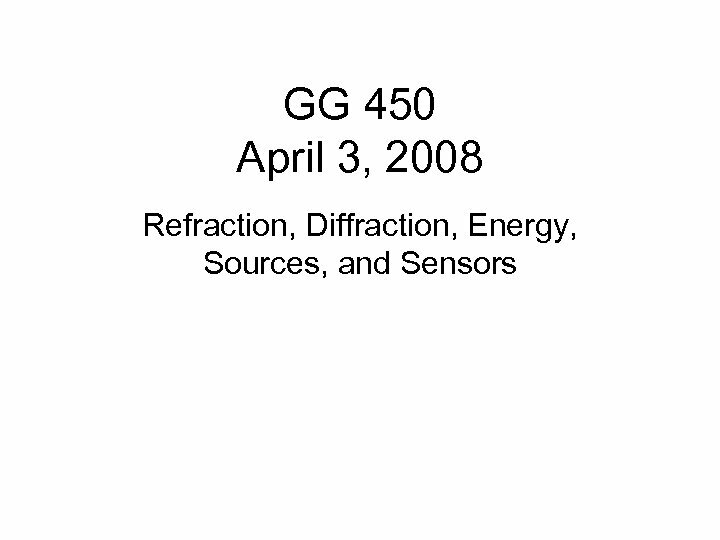 A TRANSDUCER: changes one type of energy into another [motors, generators, etc. ]. 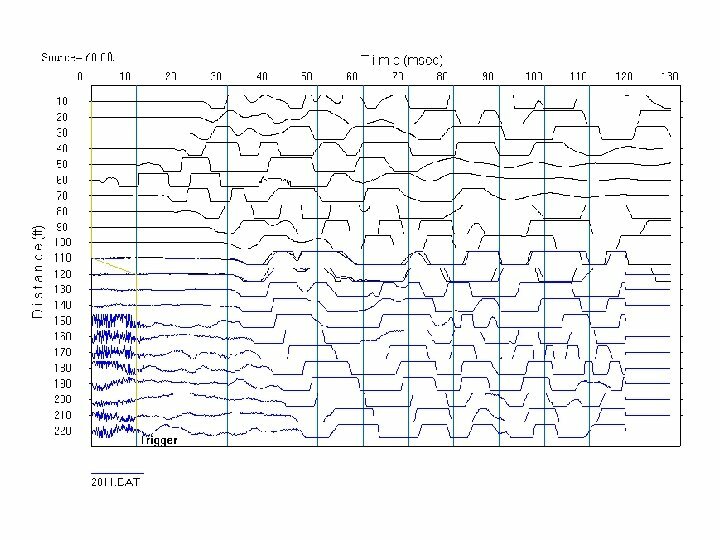 In seismometers we change ground shaking into electrical signals. There are several ways to do this. If we use a magnet surrounded by a coil of wire to generate an electric signal when the magnet and coil are moved with respect to each other, then the VELOCITY of the coil relative to the magnet gives us the signal. 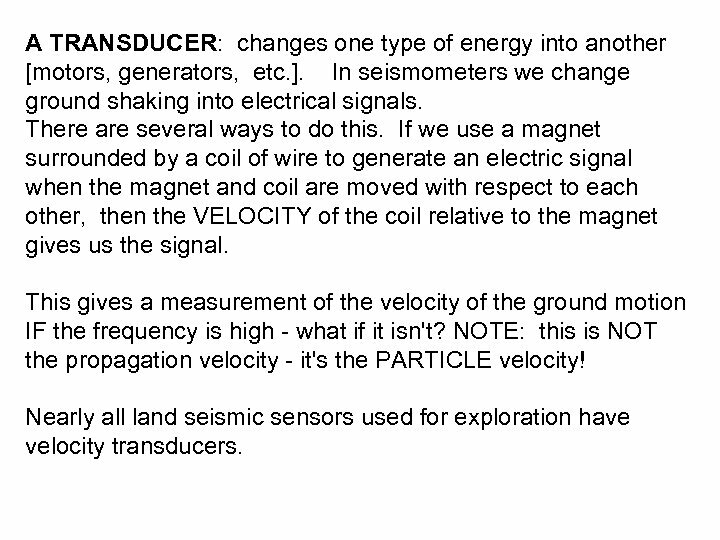 This gives a measurement of the velocity of the ground motion IF the frequency is high - what if it isn't? NOTE: this is NOT the propagation velocity - it's the PARTICLE velocity! 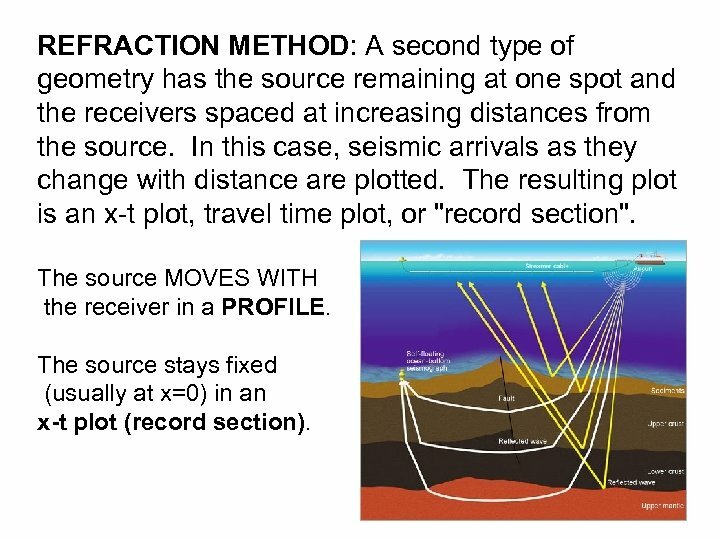 Nearly all land seismic sensors used for exploration have velocity transducers. To measure the motion of the earth, we need to be able to measure the motion of some point connected to the earth RELATIVE to some point that is NOT moving with the earth. 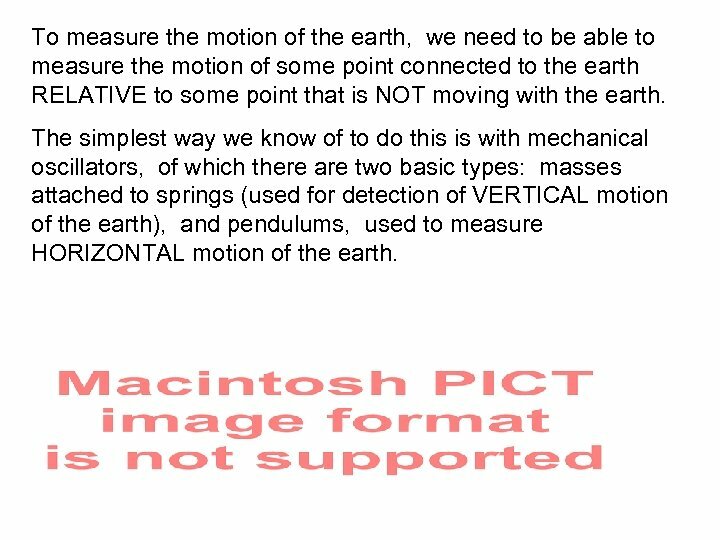 The simplest way we know of to do this is with mechanical oscillators, of which there are two basic types: masses attached to springs (used for detection of VERTICAL motion of the earth), and pendulums, used to measure HORIZONTAL motion of the earth. While these two instruments look pretty much alike, one measures horizontal motion in-and-out-of the page, and one measures vertical motion. The SIGNAL is the relative motion between the frame fixed to the earth and the mass. The frame moves with the ground at all frequencies. 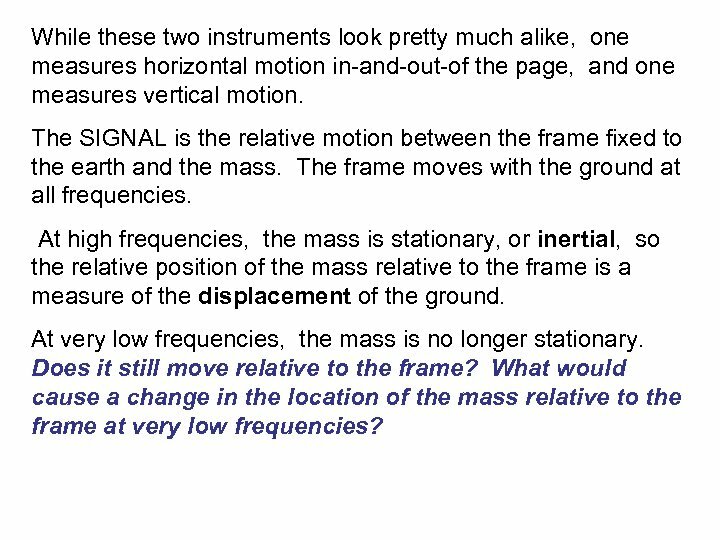 At high frequencies, the mass is stationary, or inertial, so the relative position of the mass relative to the frame is a measure of the displacement of the ground. At very low frequencies, the mass is no longer stationary. Does it still move relative to the frame? 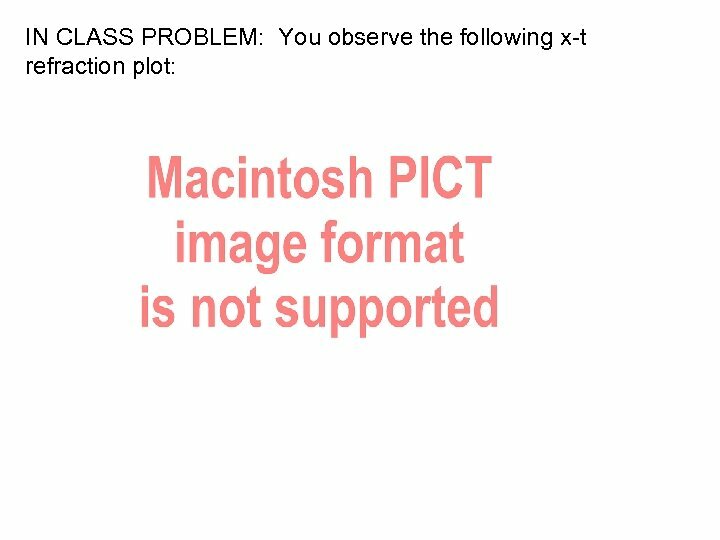 What would cause a change in the location of the mass relative to the frame at very low frequencies? A horizontal seismometer like that shown on the previous pages can be centered easily in the same way that you would adjust a swinging gate to always remain closed. How do you adjust a gate to always swing to the “closed” position? Which seismometer measures vertical motion and which horizontal motion? A gravity meter uses the same design as the vertical seismometer. 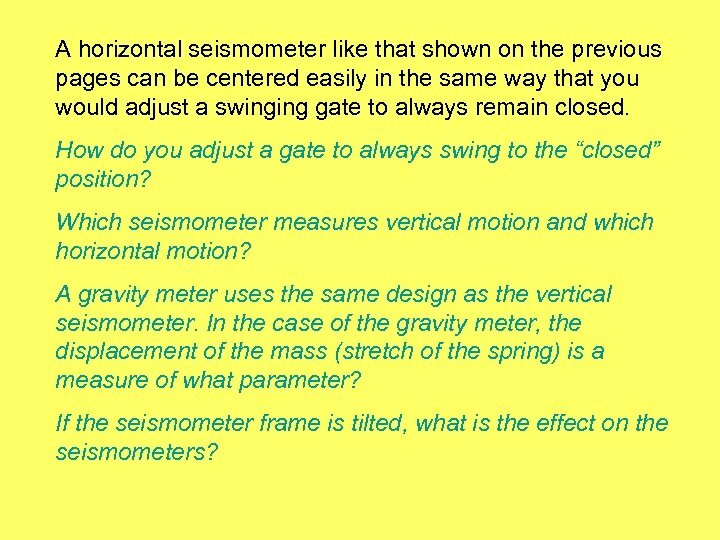 In the case of the gravity meter, the displacement of the mass (stretch of the spring) is a measure of what parameter? 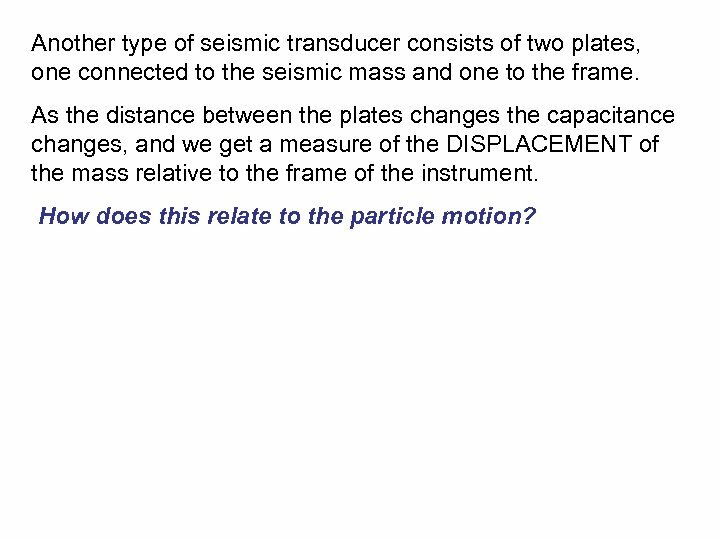 If the seismometer frame is tilted, what is the effect on the seismometers? This seismometer is called a GEOPHONE. The motion of the ground is detected by a coil of wire moving through a magnet attached to the frame generating a current. If the coil is not moving relative to the frame, no signal is generated. 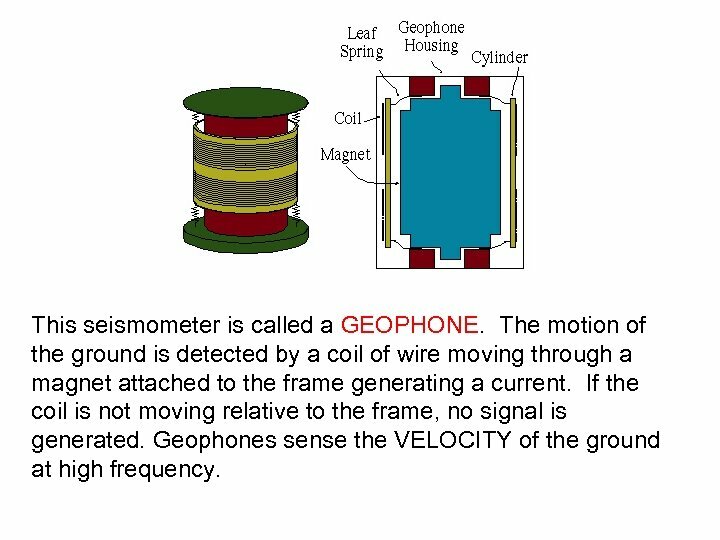 Geophones sense the VELOCITY of the ground at high frequency. What are desirable characteristics of a seismometer? 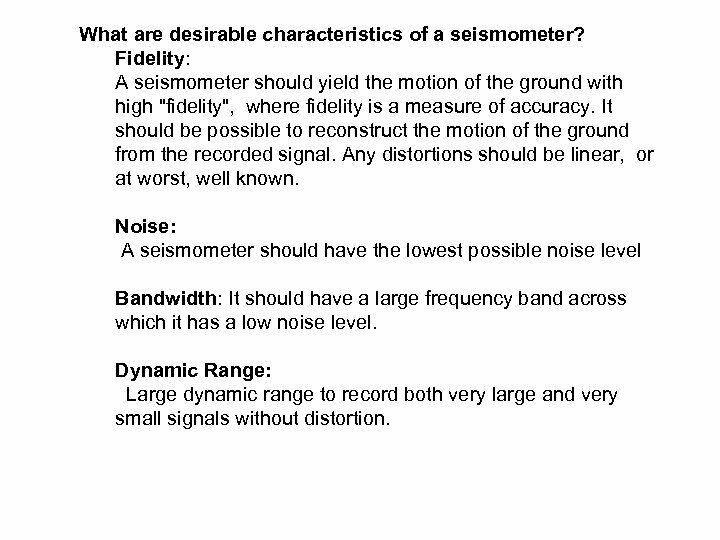 Fidelity: A seismometer should yield the motion of the ground with high "fidelity", where fidelity is a measure of accuracy. It should be possible to reconstruct the motion of the ground from the recorded signal. 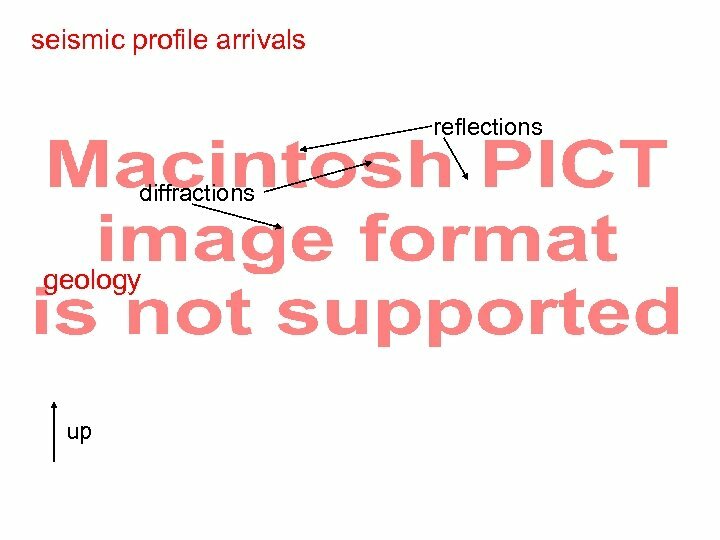 Any distortions should be linear, or at worst, well known. Noise: A seismometer should have the lowest possible noise level Bandwidth: It should have a large frequency band across which it has a low noise level. Dynamic Range: Large dynamic range to record both very large and very small signals without distortion. Another type of seismic transducer consists of two plates, one connected to the seismic mass and one to the frame. As the distance between the plates changes the capacitance changes, and we get a measure of the DISPLACEMENT of the mass relative to the frame of the instrument. How does this relate to the particle motion? 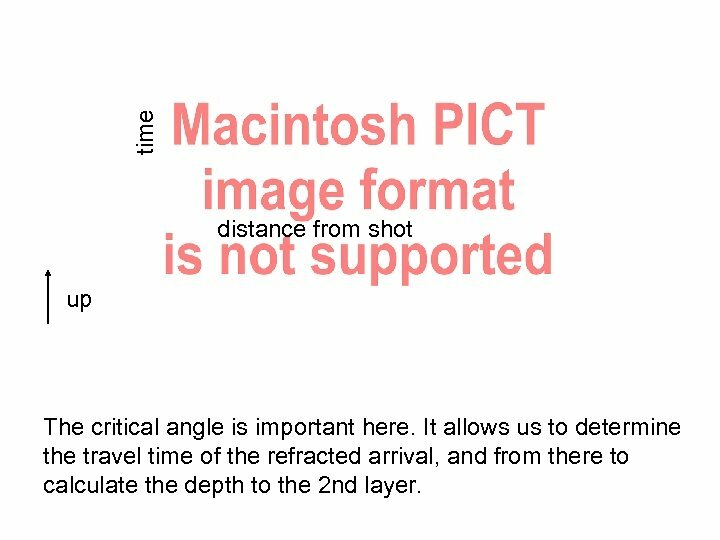 time distance from shot up The critical angle is important here. It allows us to determine the travel time of the refracted arrival, and from there to calculate the depth to the 2 nd layer. 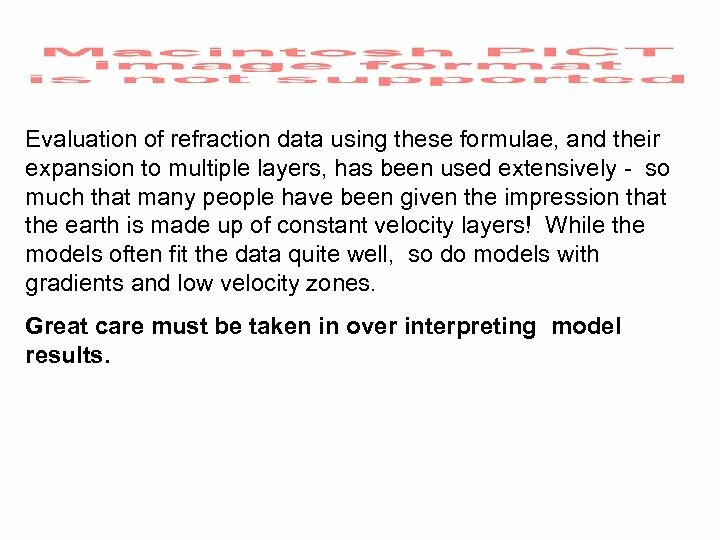 Evaluation of refraction data using these formulae, and their expansion to multiple layers, has been used extensively - so much that many people have been given the impression that the earth is made up of constant velocity layers! While the models often fit the data quite well, so do models with gradients and low velocity zones. Great care must be taken in over interpreting model results. A refracted arrival has a slope of 5 ms/10 m. The direct layer arrival has a slope of 2 ms/m. 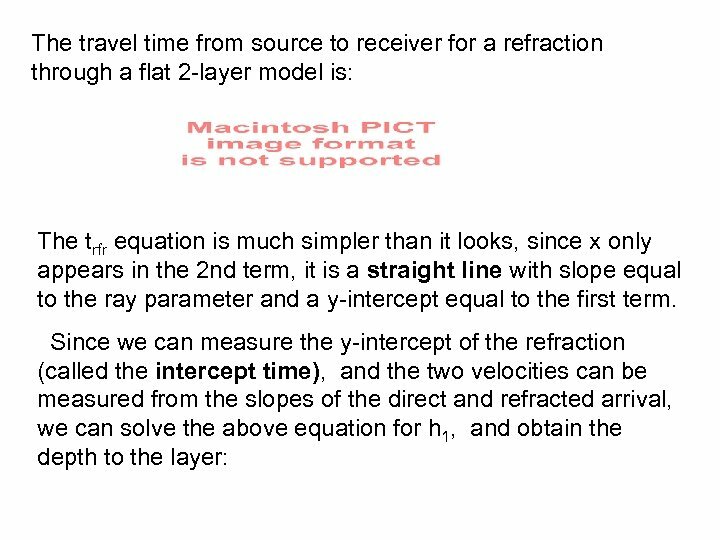 The intercept time of the refracted arrival is 20 ms. 1) What is the velocity of the upper layer? 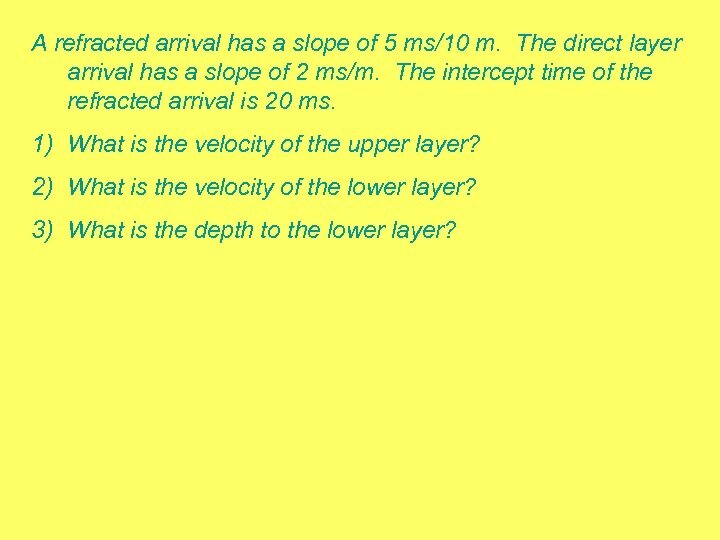 2) What is the velocity of the lower layer? 3) What is the depth to the lower layer? 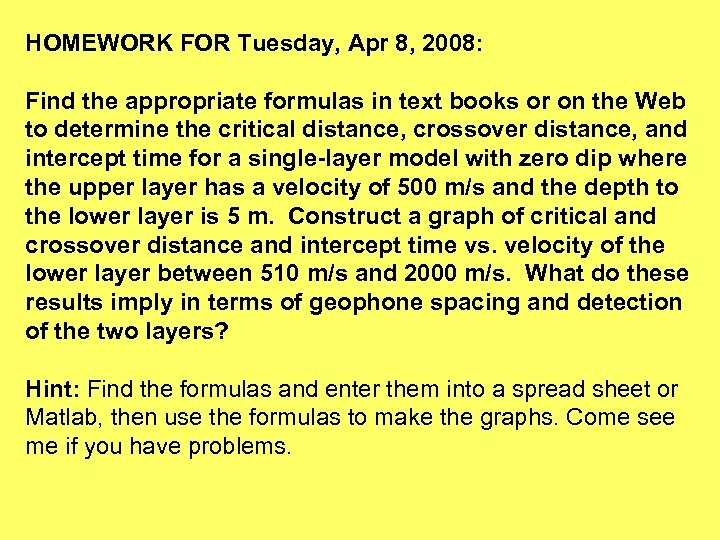 HOMEWORK FOR Tuesday, Apr 8, 2008: Find the appropriate formulas in text books or on the Web to determine the critical distance, crossover distance, and intercept time for a single-layer model with zero dip where the upper layer has a velocity of 500 m/s and the depth to the lower layer is 5 m. Construct a graph of critical and crossover distance and intercept time vs. velocity of the lower layer between 510 m/s and 2000 m/s. What do these results imply in terms of geophone spacing and detection of the two layers? Hint: Find the formulas and enter them into a spread sheet or Matlab, then use the formulas to make the graphs. Come see me if you have problems. The critical distance is the distance from the source where the refraction can first be observed. 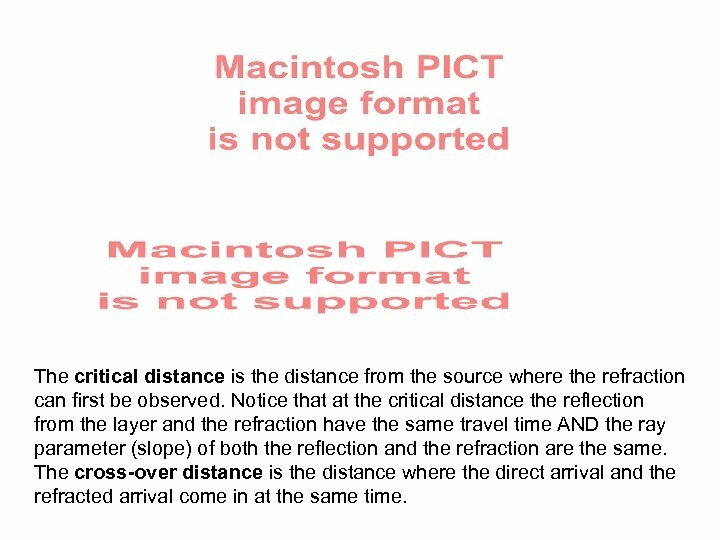 Notice that at the critical distance the reflection from the layer and the refraction have the same travel time AND the ray parameter (slope) of both the reflection and the refraction are the same. The cross-over distance is the distance where the direct arrival and the refracted arrival come in at the same time. The closest geophone is 5 m from the shot point. Note that when you extrapolate the first arrival time back to zero distance it doesn't go through the origin. 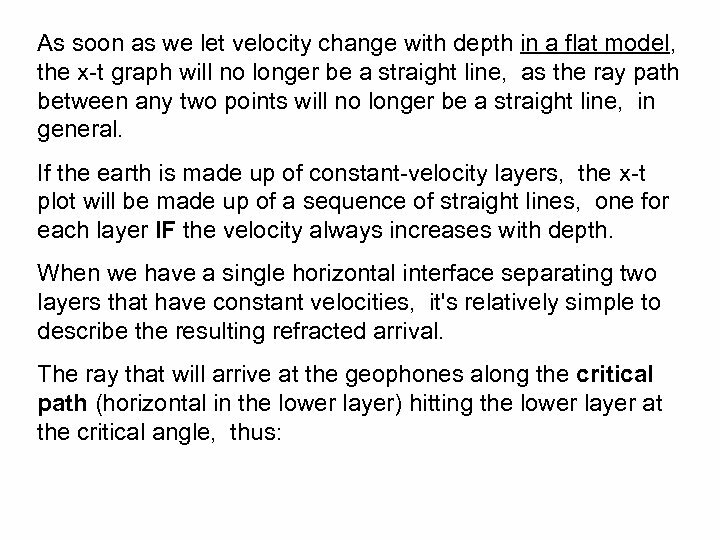 1) What is the velocity of the layer observed? 2) Is this the velocity of the surface layer? 3) What limits can you place on the thickness and velocity of the surface layer? 4) How could you prevent this problem and get the surface layer model parameters “exactly”?